UCCFS: Nachos vs Shrimp Cocktail Round 1 – I Love It Spicy! 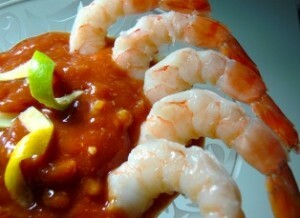 This is another pairing of great comfort foods with #2 seed Nachos vs #15 seed Shrimp Cocktail. I can not imagine this being close for 2 reasons. Firstly, most people voting here are chileheads, and nachos is a chilehead feast. Secondly, you can’t do all the things you can do with shrimp cocktail as you can with nachos. Shrimp size and garnish along with the strength of cocktail sauce is your only variables. While nachos can go with so many toppings you would need to start up another thread just to list them all. 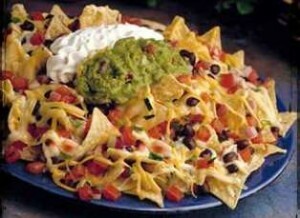 I think a nacho contest is definitely in order in next year’s Feast Your Eyes on This cooking challenge. Hint hint. So as much as I love me shrimp and cocktail sauce dunking, I do not think it can beat nachos in a contest where chileheads get to be the deciding factor. What say you? You have any nacho or shrimp cocktail stories to share, please do. I like shrimp but from a comfort food perspective gotta go with nachos. Sounds like Al’s trying to influence the vote! Where is the impartial commissioner of the UCCFS? Love shrimp cocktail, but nachos could win this whole thing! I love nachos, but shrimp cocktail is not something I have too often, so it might be a matter of thinking about it more. I love cocktail sauce strong kind of like we had at Acme Oyster House in Nawlins. The best Shrimp Cocktail vs the best Nachos, sorry folks I go with those huge ginormous shrimp. I love me some shrimp cocktail but I’d go for nachos anytime. Easiest decision in weeks. Nachos. NACHOOOOOOOOOOOOOS!!!!!!!! All the way on this one! Hi, this weekend is nice in favor of me, since this occasion i am reading this impressive informative piece of writing here at my house.